A precocious tree, the serviceberry (Amelanchier arborea) is one of the first trees to bloom in the spring. Its creamy white or pale pink star-shaped flowers bloom in loose clusters toward the tips of the branches soon after the ground has thawed in March and April. Songbirds and mammals, including black bears, eat the serviceberry’s fruit, which are small and round and red, purple and black in color. 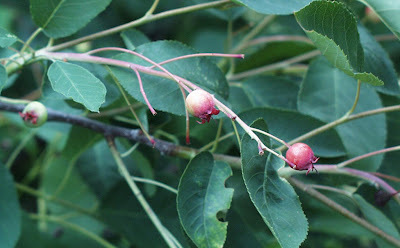 The tree fruits in early summer until August. The ovate leaves have small, sharply pointed teeth and fine, soft hairs on the surface when young. Serviceberries are native to woodlands in the United States from the Great Plains eastward to the coast and north into Canada. The fruit of the serviceberry tastes like a blueberry and is eaten fresh or used in pastries and desserts. In some regions, the flowers are gathered for religious services, thus giving this tree its common name. George Washington enjoyed the serviceberry and planted several specimens at his Mount Vernon estate. Use our interactive map to see where we have planted serviceberries. 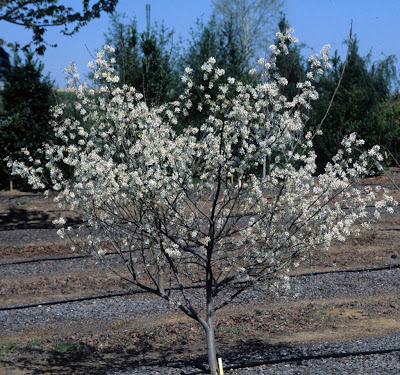 Search for "Serviceberry" under the category Casey Trees' Plantings. Casey Trees has planted 402 varieties of serviceberries, with plantings in every ward of the city. Keep your eyes out for the serviceberries’ beautiful blooms this spring and when the berries begin to show, harvest them and make a pie! We planted 3 serviceberry "autumn brilliance" in our small Capitol Hill backyard last year. The flowers are very pretty, if short-lived in the spring. The fruit tastes a bit like a nutty blueberry, but with less sweetness. We left most of the berries for the birds. The only two problems: some really gross cedar rust on some of the berries and a nasty lace bug infestation on the leaves late in the season. I am hoping the trees will be less stressed this second year and that natural predators will discover the lace bugs. Thanks for your feedback on your experience with serviceberries and good luck with your trees in the spring and summer.